Welcome to Best Thing We Ate This Week, where each week, we'll have a special guest or Thrillist staff member talk about a New York dish they recently tried and loved. This week, Top Chef alum and chef/owner of Talde, Massoni, Atlantic Social, and the forthcoming The Heights, Dale Talde, tells us about his favorite omakase in NYC. My wife and I ate at Shuko this week, and it was pretty stellar. We did the omakase. It's a traditional omakase where you sit in front of the guy and he describes what you're eating. For my two cents, it's the best in New York. My wife and I were blessed enough to go to Tokyo, and we went to mecca for omakase basically; we ate our weight in omakases up and down there. 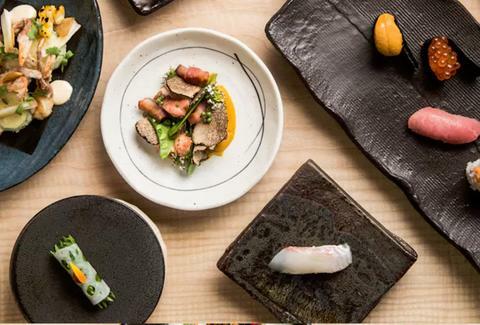 In the States, and especially in New York, Shuko is the closest thing you'll get. We had about 20 things, so it's hard to pick exactly what was the best. But one thing that stood out was the hand roll. It's made with seared bluefin tuna, charred toro, uni, and caviar and then wrapped in nori. They toast the nori right before it's served. Oftentimes, it's made before service and cooled and put away. They actually had a little charcoal right next to them that's constantly burning, and they do it to-order, so it's super-crunchy. You have this really roasted sesame nori flavor, and it's so good. You don't often get that when you get a hand roll. The experience was also very personable; the staff at Shuko makes you feel so welcome. It's not a stuffy dining experience (even if the [$135] price tag might make you feel like it is ). The chef is always asking you what you like and if there's anything else he can get for you. I feel like in Japan you can get cold-shouldered a little bit, especially if there's a regular at the table. This was not the case. It's fun, it's loose. And stuffy dining experiences are just not my thing.